I am back with my second attempt at the 10 minute craft dash, and I must say I am now hooked! This second card went much more smoothly - so much so that I ended up making two of them. The first time it took me 9 minutes and 28 seconds including the time to set up the pre-coloured digi in a document and print it. Since the digi was already set up for the second one, it only took 5 minutes 30 seconds! Perfect for mass producing and mailing as it is very flat. Thanks for stopping in and for taking the time to leave a comment! Have a great week! Your card is amazing Dawn! Love the image and the colours. The cardinal looks simply stunning printed onto a plain white background! Enjoy your day! Awesome! 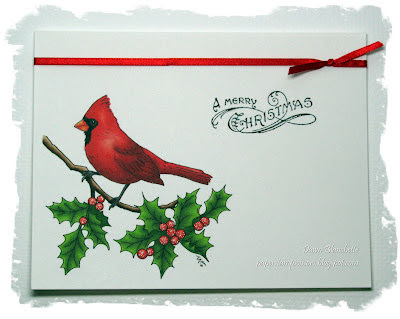 Love cardinals for Christmas :) I'm going to have to check out that digi meself. Gorgeous! Love your coloring! Thanks for joining us for the Simon Says Stamp Challenge! Love that you're already starting on your Christmas cards- you're so on top of things! Hearing you're hooked on our new challenge just makes me SO happy! Hope you'll join us for the second challenge in September! Fab card, love the ribbon hightlight and the image is lovely. "HOOKED!" that's what we like to hear! :D super lovely card--your coloring is PERFECT! i think this card is just right for sending off... you won't have to worry about that pesky extra postage! again, thanks for joining us :D we're so glad you played along AGAIN :D come back next time too! Hi Dawn, and it turned out beautiful!